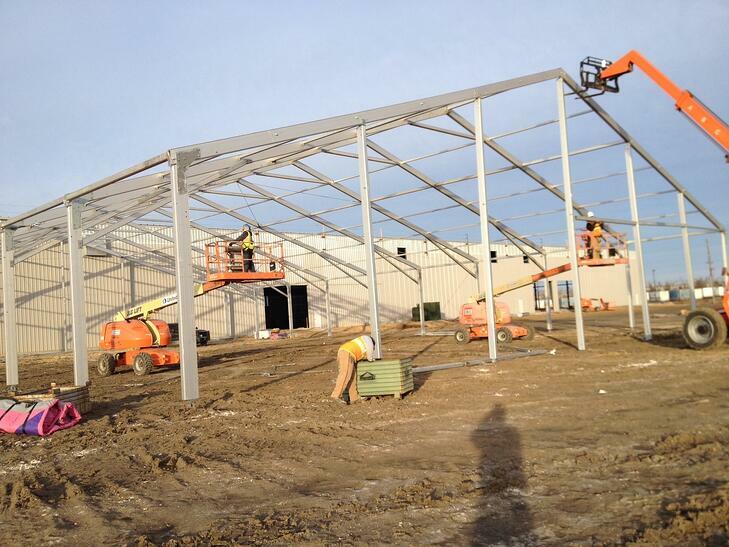 Mahaffey's ability to customize is the defining factor that differentiates our temporary fabric structure construction from that of other temporary structures. Regardless of the terrain, our specially-trained teams can calculate precise measurements to guarantee safety and security, while meeting local building code requirements. Once the framework of the structure is complete, it's time to consider the support installation. Aluminum box beams provide the secure footing for each design. Beams are a major component in the assembly phase, as they help to reinforce the stronghold of your temporary structure. One of many important decisions to make is the type of fabric you select. Do you need natural light? If so, translucent fabric is the way to go. Do you need the cover to withstand harsh environments, such as wind, snow and possibly fire? If that’s the case, Précontraint fabric is the better option. Mahaffey was recently able to exhibit its flexibility in tackling a challenging situation while constructing a temporary fire station with 13-foot legs on one side and 16-foot legs on the other. Additional purlins were added to the structure to ensure strength and stability. The entire building was insulated, while the top layer of the roof was heavily padded to sustain the harsh weather. These specialty fabrics provided protection from freezing and fire, and environmental protection is always a key element to consider during structure installation. Adding the final touches, Mahaffey provided customized electrical doors to and electrification of the temporary fire station's interior. Timeframe — Traditional construction has huge costs associated and can require years of lead time compared to Clearspan tents. Awaiting the completion of metal and concrete building construction can place your project or expansion far behind schedule, whereas using a temporary structure to cover your project site is an efficient way to provide much-needed, climate-controlled coverage fast. Cost — Temporary structures provide a lower-cost alternative to permanent buildings. Plus, when time is money, temporary structures reduce the strain on corporate budgets, allowing your company to allocate more of the project budget for other uses as business needs evolve over time. Additionally, a new permanent building must be sold, rented out or redesigned when no longer needed. With a temporary structure, you can install a solution for just the time (and location) needed. Once the need for the building ends, it can literally disappear, and your site can return to its original landscape. Flexibility — Every company's requirements are different, and opting for a temporary structure allows for the size and space used to be adjusted along with your changing needs. Furthermore, the installation of a modular, temporary structure allows for these changes to happen in an expedited fashion without large construction costs. Interested in learning more about temporary structures and the factors to consider for your next project?